So, officially/unofficially I am taking a year-long sabbatical from doula work. I feel called (and lucky) to do many things with my time! To spend as little time as possible sitting in traffic. I love Chicago and all the benefits of living near a big city (I really do!) and recognize that traffic is something that goes with that. A lot of people want to be here, right? (I realize not everyone does lol). Do all I can to lead a healthy, pain-free life. As many of you know, I’ve suffered from debilitating knee pain for the last three or so years. My best guess is that it stems from both a terrible orthopedic diagnosis post-injury early on (“You’re fine, just exercise on it”), substantially worsened by severe inflammation in reaction to a flu shot (don’t hate). It’s led to me being old before my time. I love to walk and long to go birdwatching (I know!) Or to just be in the city all day without having to think about it so much. To ride my bike. To walk my dog. I need a good PT and a trainer and a good yoga class and have just joined the new Lombard athletic center which I am totally psyched about. It’s brand new and right around the corner and has a nice vibe with lots of kids and teens using the basketball courts (I am now one of those old people who enjoys being around other people’s children). I want to write. I want to write for money. I want people to read what I write. I want to make people laugh. I want to lead a creative life. I want to speak more. I’m taking a break from Lamaze too — something I love but just not where my head is at right now. 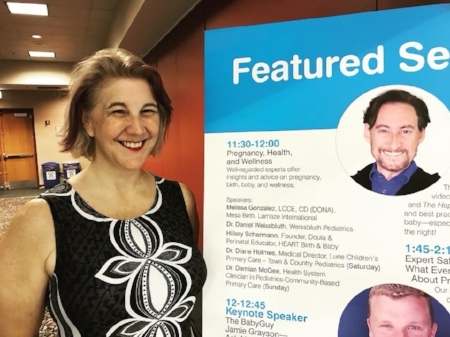 I had an opportunity to speak on a panel at the Chicago Baby Show this summer — alongside two big city pediatricians and a fellow doula (holla Hillary Scharmann! xoxo). I’ve long loved the performance elements of public speaking (shy in person, I love the spotlight!) and I like dropping knowledge. Doing the panel itself was eye-opening and I truly think there ought to be way more doulas and childbirth educators on those things talking to parents! Doctors are great and all, but they really cannot form reasonable informed opinions about family life from observing patients in their office. Please let’s hear more advice from birth professionals who are in the trenches (and the homes and hospital rooms and bedrooms) with new parents from before the get-go. Any experienced birth doula has seen a thousand things you’ve probably never imagined. Any experienced postpartum doula knows how to calm a baby like nobody’s business and can also teach anyone else how to do it. Any good childbirth educator understands what parents-to-be are worried about right now. You do not need a medical degree to offer wisdom to new parents. I want to do something in service to my country and my community. I’m not sure what that looks like yet. I have bought and given away at least three sewing machines as an adult. In my life I sewed a skirt of red denim (with a zipper in it!) In Home Ec and a kimono-style robe that I wore for years. Also, I made kitchen curtains during a multi-day snowstorm in Bloomfield one year. And, I took a hand-stitched quilt class (based on designs made by enslaved persons in the American South) at the Cleveland Metroparks which brought me back into handwork. The point is that it is my goal to start and finish an historical costume for myself for next year. I’d love an event to plan for so if anyone shares my secret passion please let me know of anything good! At this point in time I still don’t have a sewing machine and feel intimidated and kind of scared (precision work and math are my enemies) and I want to feel more of that. I also want to feel more feelings of accomplishment.